(Nanowerk News) A*STAR scientists have created a ‘prospector’s guide’ to help researchers locate the best germanium–silicon nanowires for catalyzing important clean-energy reactions ("Computational screening for effective Ge1-xSix nanowire photocatalyst"). 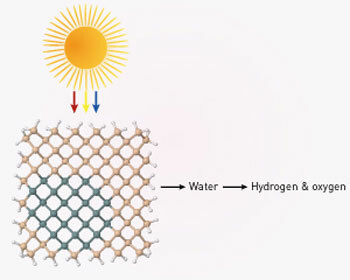 Using sunlight to split water into its constituent elements, or to convert carbon dioxide into carbon monoxide or hydrocarbons, are among the most viable methods for reducing greenhouse gas emissions. To realize their potential, both clean-energy reactions require catalysts. Calculations indicate that an asymmetric distribution of a germanium core in a silicon shell imparts better catalytic properties to nanowires than symmetric distributions. Silicon is advantageous because its properties are well studied and it is an abundant material, but the ‘band gap’ between its conduction and valence bands is too narrow to effectively catalyze these reactions. This deficiency can be overcome in two ways: by ‘nanosizing’ silicon or by experimenting with different alloys of silicon. Now, Teck Leong Tan and Man-Fai Ng at the A*STAR Institute of High Performance Computing have used computer simulations to explore the effect of varying the diameter of germanium–silicon nanowires and also the ratio of silicon to germanium on the catalytic properties of the alloy. The pair combined three established computational methods to perform their calculations: density functional theory, cluster expansion and Monte Carlo simulations. While this combination of techniques has been used before, the researchers discovered a simple correlation that enabled them to predict band gaps accurately using simpler computational methods. This considerably reduced the computational cost, enabling more alloy nanostructures to be screened than usual. The results indicate that germanium–silicon nanowires with diameters of three nanometers or smaller are suitable photocatalysts for both water splitting and carbon dioxide reduction. Their calculations also predict that nanowires with asymmetric core–shell structures (see image) will be more effective than those with conventional symmetric ones. Finally, nanowires with diameters between 2 and 3 nanometers should have band gaps that are well matched to the spectrum of sunlight, making them effective light harvesters. The two scientists are eager to collaborate with experimentalists to confirm the predictions generated by their calculations. They also intend to apply the technique to other promising semiconductor nanowire alloys.